Week 11 of the 2017 NFL season is nearly in the books and there are a number of major takeaways. Here’s what you need to know from every game on the Sunday slate. With Zach Miller out for the season and Dion Sims banged up, the rookie tight end played 46 snaps and caught four balls for 41 yards and a score. Shaheen is a big-bodied player with a basketball background who has sneaky appeal in deeper leagues. That being said, it isn’t wise to get too carried away here. The Bears will continue to be a run-heavy offense going forward. At best, Shaheen is a TE2 streamer down the stretch. Leonard Fournette plays through ankle injury. Despite barely practicing, Fournette managed to suit up and posted a respectable 111 yards on 28 carries. The production is encouraging, but Fournette noted after that game that the injury will likely continue to bother him for the rest of the season. That puts Fournette owners in a bit of a predicament. He’s the type of player who shouldn’t be benched as long as he’s on the field, but could also suffer a setback at any point. As of now, Fournette remains a volatile RB1. Jordy Nelson’s fantasy value continues to tumble. The Packers receiver was sixth among wideouts in fantasy scoring over the first five weeks of the season. Since then, he ranks 77th. The obvious common denominator here is Aaron Rodgers. Brett Hundley took over for Rodgers in Week 6 and has only managed to connect with Nelson 16 times for 152 yards and no scores. Hundley is also coming off a dreadful outing where he tossed three interceptions and took six sacks. It certainly isn’t outlandish to drop Nelson if you haven’t done so already. 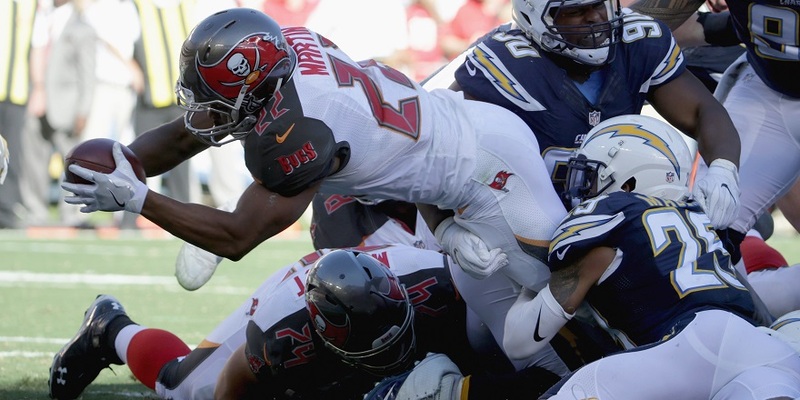 Is it time to drop Doug Martin? That’s a question many fantasy owners are asking themselves after yet another disappointing performance from the Tampa Bay running back. Martin averages just 3.1 yards per carry and hasn’t found pay dirt since Week 6. While it’s tempting to cut him loose, Martin see’s enough volume to keep him on most fantasy rosters unless there’s a very strong option on waivers like Samaje Perine. Don’t panic if you own Jerick McKinnon. Yes, Latavius Murray put up the bigger fantasy day, but McKinnon owners shouldn’t overreact. McKinnon out-touched Murray 18-15. More importantly, he played well. The committee in the Minnesota isn’t going anywhere, and that means there’s the potential for more weeks like this. That being said, McKinnon’s ceiling remains high enough to continue to warrant RB2 consideration going forward. Murray doesn’t possess the same ceiling, but his touchdown upside also places him in the RB2 conversation. Saints backs in the midst of a historic run. Both Mark Ingram and Alvin Kamara finished as RB1s yet again this week. What we’re seeing in New Orleans is truly unprecedented in the realm of fantasy football. Since Adrian Peterson was traded in Week 6, Ingram and Kamara rank No. 1 and 2 among running backs in fantasy scoring. It’s rare enough to have two RB1s on the same team, much less the top two options. Better yet, the Saints show no signs of slowing down. Keep riding the wave in the New Orleans backfield. Kareem Hunt isn’t playing as poorly as you think. There’s a widespread narrative spreading around fantasy circles that Hunt isn’t playing well. Here’s an example where fantasy needs to come back to reality. Hunt isn’t producing fantasy points, but that does not mean he’s playing poorly. He touched the ball 21 times on Sunday, which is feature-back volume. His 77 scrimmage yards aren’t anything to write home about, but Hunt’s day would have been much bigger were it not for a couple crucial penalties on big runs. Better yet, he continues to be one of the league’s most elusive backs with another five forced missed tackles this week. Patrick Peterson’s shadow doesn’t matter for DeAndre Hopkins. It wasn’t a massive day for Hopkins, but he still managed to post WR1 numbers with four catches for 76 yards and a score. More importantly, Hopkins did so despite seeing shadow coverage from Peterson. In Peterson’s coverage, Hopkins caught 3-of-7 targets for 65 yards and the score. The moral of the story is that it doesn’t matter who is under center Texans or who is covering Hopkins. He’s going to post WR1 numbers regardless. Apparently, it isn’t just running backs who go off on the Bills. Allen had his best performance of the season with 12 catches on 13 targets for 159 yards and two scores. Entering the week, Allen hadn’t topped 100 yards since Week 4 and it was the first time he scored since Week 1. Allen’s arrow is pointing up, but don’t overvalue this week’s performance. He remains a WR2 going forward. Devontae Booker out-touches C.J. Anderson. The second-year back handled 19 touches on Sunday, which was four more than Anderson. Booker managed just 3.1 yards per carry as a runner, but also posted 54 yards on five catches. 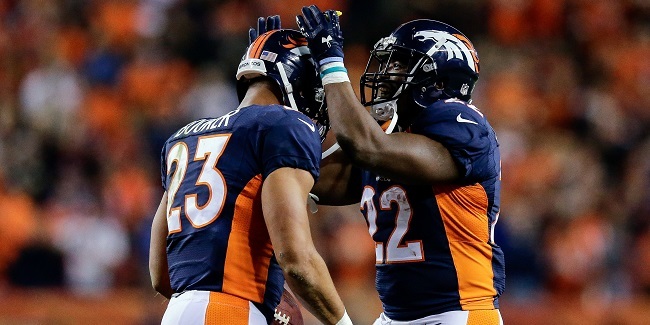 While things are uncertain in Denver after offensive coordinator Mike McCoy was fired, Booker is worth a speculative add on this week’s waiver wire. Brandin Cooks torches the Raiders again. In his last meeting against Oakland, Cooks went off for 142 yards and two scores. It was more of the same this week, with Cooks racking up 149 yards and a score. While it hasn’t been the most consistent season for Cooks, he currently sits fifth among wide receivers in standard scoring and ninth in PPR. Jay Ajayi still ramping up. As we expected, the Eagles continued to use a committee in their backfield with LeGarrette Blount leading the way with 13 carries. However, Ajayi flashed major upside yet again with 91 yards on seven carries. Most of Ajayi’s yards came on a 71-yarder where the newly acquired back burst through the middle and nearly took it to the house. Fantasy owners can expect Ajayi’s workload to continue to increase as we go forward. A 20-carry day isn’t likely to happen in the near future, but Ajayi’s upside is high enough to warrant every-week RB2 consideration.